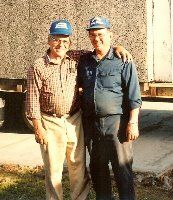 5 Generations of House Movers - the Experience You Need! Goodwin House Moving was started in 1930 by Bill Goodwin, and soon his brother, John, took over the business. Some of the equipment John Goodwin used at this time, were his team of horses, hard maple wheels, and steel wheels. Kenney Goodwin ran the company from 1936-1942 until he went into the army. After he returned in 1944, he continued to move houses for another ten years. During Kenney's years in the house moving business, steam engines were standard in the industry. He was not satisfied and started making most of his moving equipment, even the dollies, by hand. He eventually bought a truck and averaged 10 to 20 house moves a year. In 1954 his son, Jerry, took over the business and started out with his fathers home made equipment. He eventually switched to steel beams, hydraulic jacks, and bigger trucks. Jerry was easily able to move 20 to 30 houses a year using the latest technology. Like his father did before him, Rick Goodwin, Jerry's son, took over the business in 1983 and has continued to run the company with the same pride and quality. Rick and his team celebrate over 80 years in this business and are proud to say they are the original Washington, IA house moving company. Keeping the family business strong, Rick's son-in-law, Chris, has joined the Goodwin team. 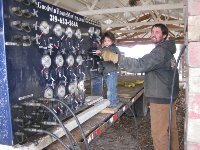 Here Chris is pictured with his son Colben - maybe a 6th generation of Goodwin movers? We have come a long way since our inception in 1930. Today we have hydraulic dollies, hydraulic fifth wheels, hydraulic jacking machine, and precision machinery rollers to help us move our houses. Goodwin House Moving averages 80 to 90 moves per year.